This moated bishops' palace was built in 1250 by Walter de Suffield, Bishop of Norwich. It was used by other bishops until the ownership of the land passed to the Crown between 1500 and 1525. Part of the moat was still water filled when the earthworks were surveyed in 1981. Fieldwalking and metal detecting have recovered many medieval and post medieval finds including a medieval copper alloy horse harness pendant with the heraldic design of the Bishopric of Norwich. Site of Bishop's Palace, and Joshua's Pond (Ordnance Survey Antiquities). Ordnance Survey revisors found tile scatter and one sherd greyware, partly green glazed, 13th to 14th century, on central island which is a raised platform. No trace of buildings within moat, but farmer says he has ploughed up bricks here since he bought the property around 1973. For details of park Farm noted during this visit see NHER 43102. Owner very interested and says a student from Hull University showed previous owner drawings and plans of palace, whereabouts now not known! (S2) shows Joshua's Pond as Fox Pond with old road looping round it but also new road cut across it. A massive earth dam remains across north end pond like (S3). Medieval coin, medieval and post medieval objects. A. Rogerson (NLA) 10 February 1998. Three medieval coins, post medieval jetton. A. Rogerson (NLA) 7 April 1998. A. Rogerson (NLA) 10 October 1998. Undatable worked flint and metalworking debris. Medieval and post medieval coins, medieval and post medieval metal finds including a horse pendant with arms of Bishop of Norwich. A. Rogerson (NLA) 9 November 1998. December 1998/January 1999. Metal detecting. A. Rogerson (NLA) 9 February 1999. Late medieval and early post medieval metal finds. August to September 1999. Metal detecting. ?Early Saxon medieval and post medieval metal finds. See lists and (S4) in file. A. Rogerson (NLA), 13 October 1999. January to February 2000. Metal detecting. One post medieval coin. See list in file. One copper alloy shield-shaped pendant from horse harness, red enamel and small traces of gilding survive. See (S4) with blazon in file. A. Rogerson (NLA), 8 March 2000. February to March 2000. Metal detecting. ?Medieval object. Medieval/post medieval buckle. A. Rogerson (NLA), 13 April 2000. A. Rogerson (NLA), 9 December 2000. November to December 2000. Metal detecting. A. Rogerson (NLA), 9 January 2001. Medieval and post medieval seal matrices. Medieval horse harness pendant. See (S5). 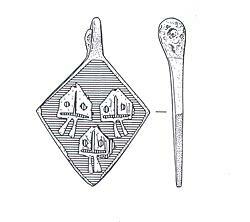 Late medieval/early post medieval thimble and buckle. S. Ashley (NLA), 9 October 2001. Three Roman, three medieval and two post medieval coins. Medieval buckle or belt mount. Medieval or post medieval cauldron. A. Rogerson (NLA), 11 December 2002. December 2002/January 2003. Metal detecting. Two medieval and one post medieval coin. A. Rogerson (NLA), 5 February 2003. Interior ploughed to around 30cm (12 inches), fragments of brick/tile seen in ploughsoil. Ditches mostly filled with stream running through east side. Moat mostly wooded with old coppiced willows and other species growing in ditches and to either side. Southeast corner in area of dead wood and grass, with much dead wood in ditches. Northwest corner choked with scrub and farm refuse. Plough kept 1to 1.5m away from lip of ditch. North end of site used as area for manure dumps and farm machinery, earth churned up here. Joshua's pond clean and water filled, surrounded by pasture grazed by sheep. A few old trees in the meadow. H. Paterson (A&E), 28 February 2003. One medieval and two post medieval coins. A. Rogerson (NLA), 6 October 2003. A. Rogerson (NLA), 12 November 2003. A. Rogerson (NLA), 10 December 2003. A. Rogerson (NLA), 10 May 2005. A. Rogerson (NLA), 7 November 2005. A. Rogerson (NLA), 4 November 2006. 1 Post-Medieval coin weight and token; Medieval and Post-Medieval metal objects. A. Rogerson (NLA), 7 October 2008. --- Photograph: NLA. 2001. Finds Photograph. Polaroid. --- Photograph: 2000. KSF 22, Medieval decorative plate..
--- Photograph: 2003. KTY 5-3, Medieval gilded plaque..
--- Archive: Clarke, R. R. and NCM Staff. 1933-1973. Norwich Castle Museum Record Card - Medieval. Hevingham. <S2> Publication: Faden, W. and Barringer, J. C. 1989. Faden's Map of Norfolk in 1797. <S3> Unpublished Document: NARG. 1981. Hevingham Park Farm site of Bishop's Palace, Earthwork Survey. <S4> Photograph: I&RS. Finds Polaroid. Polaroid.